Marine Bioinvasions by ballast water used in cargo ships are of great concern to marine environmentalists. 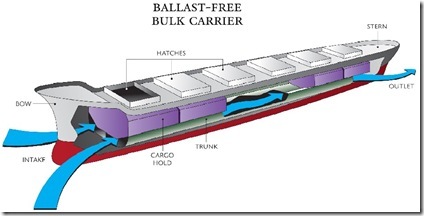 Now University of Michigan has taken up a challenge of designing a ballast free ship. If this design comes through successfully, cargo ships would become partial submarines. Ballast free ship design concept by University of Michigan utilizes constant flow of local seawater through a network of large pipes, called trunks, that runs around the ship from the bow to the stern, below the waterline. Here are the sketches of conventional ship design and ballast free ship design. Here is a fact sheet on Marine Bioinvasions by ballast water. Here is a video clip of ballast free ship design from University of Michigan. Click here or below to view the bioinvaders in Mediterranean sea.